USC Annenberg School of Journalism Director Willow Bay (left) asks a question of Los Angeles Clipper point guard Chris Paul (right) as he visited during a Journalism Director's Forum at Wallis Annenberg Hall on January 10, 2017. Updated Sep. 5, 2017 3:03 p.m.
Chris Paul, L.A. Clippers' point guard and president of the National Basketball Player's Association, visited USC Annenberg on January 10, 2017 for a wide-ranging conversation with School of Journalism director Willow Bay. 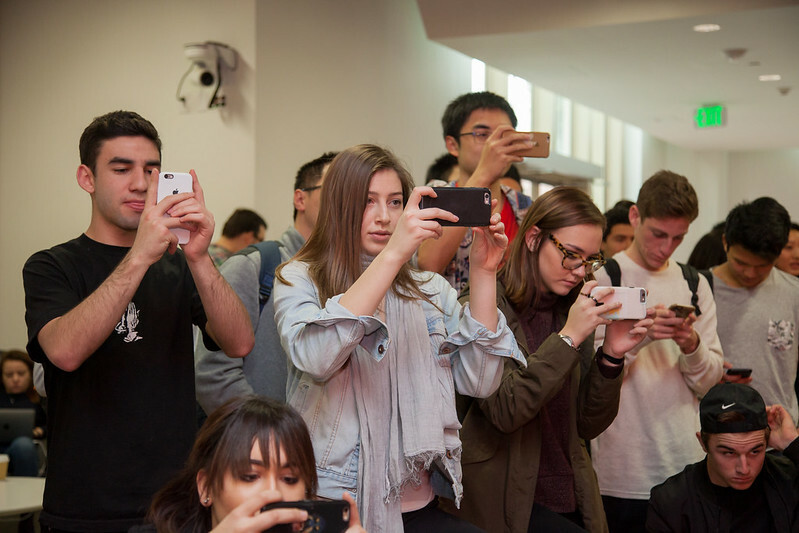 The Journalism Director's Forum was held in the lobby of Wallis Annenberg Hall, with the NBA star power attracting an overflow crowd that spilled up the stairs and onto the balconies of the multi-level building. But according to Bay, Paul is not just a celebrated athlete with two Olympic gold medals, but a great communicator who has been able to use his celebrity to help others, give back to the community and influence a multi-billion dollar league's labor relations. "I invited Chris Paul to visit Annenberg because he is a true leader with exceptional strategic communication instincts, who has used his voice across multiple platforms effectively and authentically in both his professional and personal lives," Bay said. Annenberg overall has deep and broad ties across the entire sporting landscape. Among the school's faculty are ESPN reporters Shelley Smith and Arash Markazi, as well as the Los Angeles Kings’ Senior Communications Director Jeff Moeller. Many classes offer students the opportunity to learn from sports professionals, from athletes, owners to broadcasters, and have included visits to local teams such as the Lakers and the Clippers. "Our sports studies minor is one of our biggest, and continues to grow," Bay said. "In addition, our sports journalism coverage includes daily news stories along with Sports SCene, a weekly TV sports program." One of the main topics of the conversation concerned how Paul manages himself as a brand. Using his personal handle "CP3," Paul engages with millions of followers across multiple social media accounts. "One of the biggest things I learned early in my career was 'what you're going to stand for?'" Paul said. "I have a CP3 logo. When you see that logo, it needs to mean something to you about me, my family and what I stand for. For me my brand is about family, it's about loyalty, and it's about hard work, too. One of the most important things about my brand is giving back and helping others. It's all about paying it forward and teaching somebody what you know, giving somebody that knowledge." Bay asked how Paul uses social media to communicate with different sets of audiences from friends and family to his fans and the public. "I try to have a good balance of what's for my personal life, what's for nobody, and what's for everybody else," Paul said. "It's also just being as authentic as possible. I try to give people insight on me being a basketball player, but also insight into me being a dad, me being a husband, whatever it may be. Just trying to keep it as organic as possible." The conversation also touched on last year's ESPY awards, where Paul and fellow NBA players Carmelo Anthony, Dwyane Wade and LeBron James spoke out forcefully in the wake of a number of shootings of African Americans by police. "It was very meaningful what we said and what we did," Paul said. "But what we concentrated on more after that was: Then what? It was one of those things that 'was out of sight, out of mind.' The four of us continue to do different things to help the cause." Paul then turned to the audience to answer questions from the assembled student journalists. Terrance Davis (M.S. Journalism '17) asked about Paul's role as the president of the National Basketball Player's Association, and how he has developed as a leader during his tenure. "One of the things I've learned in that position is that you're only good as the people around you, " Paul said. "When it comes to leadership, there's no 'I' in team." Conor McGlynn (B.A. Broadcast and Digital Journalism '17) asked how Paul balances being outspoken about issues with promoting himself as a brand. "I think another word I should use is 'authentic'. You always have to do your research and know what you're talking about," Paul said. "The balance for me is the family aspect, and not taking yourself too seriously. I try to do as many normal things as possible. Every day I have a routine: I wake up, I take my son to school, I go to the gym, take out the trash. That stuff keeps you balanced." Juana Lopez (M.S. Journalism '17) asked if Paul had any underlying message or philosophy that he wanted to convey. "One of the biggest pieces of advice that I got from Michael Jordan was that every time he played, he thought about the person in the arena watching them play for the first time. It's crazy when you think about it. You can take everybody for granted. He played so hard every night, because there may be somebody at that game that night, who have never seen them play. You want that person to go home and be, 'I'm so glad I got a chance to see them play.'" Click below for photos from the event.